There’s just something about the smell of old vinyl. The first time I visited Berkeley, in 2011, I was a junior in high school. I stumbled into Rasputin Music after touring campus, enticed by the grungy vibe and promise of cheap CDs and DVDs. The moment I wandered down the stairs into the basement and saw what looked like miles and miles of vinyl records, I was hooked. I bought my first LP that day — Pablo Honey, by Radiohead — an album by a band I had never listened to before (but knew I was supposed to). I didn’t even own a record player at the time. But hey, it was only $7.95. I returned senior year for the “real” college visit, and again, it was the time spent combing through Rasputin’s offerings that I remember now. I sat a few days later at Oakland airport with a bag containing News of the World by Queen as my carry-on. It cost $9.95. It was too late to go back at that point; I went all in on an Audio-Technica turntable and, hooking it to my KC-150 keyboard amp, blasted music through the walls of my room. That was in 2013. The last few years has seen me visit Amoeba Music and Rasputin (and more recently, Mad Monk Center for Anachronistic Media, to where the vinyl has been moved) probably 100 times. I loved shopping for records; I often used it as a de-stressing pre-midterm ritual (or a post-midterm retail therapy). My collection grew from two to more than 100 records; I made it my mission to buy Queen’s entire discography on vinyl, and I’ve almost done it. Coincidentally, the last few years have also seen a precipitous rise in vinyl record sales, from 4 million units in 2011 to nearly 15 million in 2017. Over the course of my time here in Berkeley, I have gotten to watch vinyl bubble up into the mainstream. A concomitant flood of think-pieces have accompanied the phenomenon: Will it last? Will it save the music industry? Does vinyl actually sound better? Are people buying records and not listening to them? The list goes on. But the proliferation of interest only points to the fact that, for whatever reason, people are buying vinyl again. To me, at least, it makes sense. 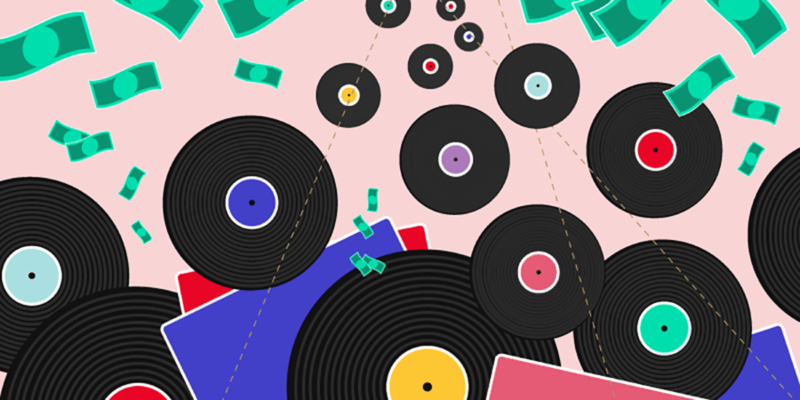 There will always be a free way to listen to music, but in an era where we pay paltry subscription fees to services such as Spotify for the right to access music, rather than owning it, the tangibility of vinyl records has immediate appeal. When you “rent” songs on the cloud, you really own nothing. For young people with an old taste in music, buying used records can open a conduit to the past — a connection to a time unexperienced. And the availability of new records allows us to more directly contribute to our favorite artists when streaming services are screwing them over. Granted, for all this hype, vinyl still accounts for a tiny percentage of the overall music market — around 6 percent of purchased music. But 14 million units sold (in 2017) is 14 million units sold, and record labels are taking notice. The best selling albums of 2017, according to BuzzAngle Music, include modern entries such as Ed Sheeran’s ÷, the “Guardians of the Galaxy” soundtrack and the “La La Land” soundtrack, alongside college dorm stalwarts such as Dark Side of the Moon and Abbey Road. What’s important to note, though, is that all the records listed here were sold new. Nielsen, or any sales tracker for that matter, has no reports of the secondhand record sales taking place. When vinyl’s comeback resulted in a trendy display case of modern and retro (but all newly minted) records for sale at the Urban Outfitters around the corner from my apartment, I scoffed at the idea of paying $35 for Pink Floyd’s The Wall, because I had bought the same record — though a second-edition (1979) release — at Rasputin Music for $3.95. I made the same face every time I was faced with the overpriced entries at Barnes & Noble. I could depend on my local, independent record stores to be a place I could purchase secondhand vinyl — it’s how I built a sizable collection of Queen albums, of Pink Floyd, of The Clash and Led Zeppelin — almost never for more than $10 a record. Collecting records was fun because on a lucky day, I could haul five or six incredible albums for around 25 bucks, with the added bonus that they were imbued with a sense of history and nostalgia. My apartment’s walls became a tapestry on which I engaged with the music that mattered to me. Visitors could enter and point excitedly, “I love that album!” My roommate and I could put on a record and sit together, enjoying it in its completeness or jamming alongside. Faced with the endless catalogs and hyper-narrowing playlists of Spotify, I could glance around the walls and pick a record I bought on a whim to toss on the turntable. But as sophomore year drifted into junior year, I started noticing those up-marked, new records of old releases at Rasputin and Amoeba, too. That, in and of itself, isn’t a bad thing. The success of the so-called “vinyl revival” has allowed more modern bands to release their music on record, giving fans the opportunity to occasionally splurge on a newly released album — for example, I recently bought The National’s Sleep Well Beast. To me, the price (I paid $27.50 for it) is worth it — not only did I get a cool blue-dyed double LP, poster, and complementary download code, I got the joy in the process of listening — of choosing the vinyl from my wall, carefully placing it on my player and listening to it straight through. It is a format that helps me appreciate albums as units rather than single songs that populate my variety of playlists. It’s a long-term investment in my relationship with that album, that band. It represents a commitment not to let that music sink into the depths of the infinite catalog of the internet to be forever forgotten. But for more than $20 a record, I could afford to add about one new record to my collection every few months. Used records, on the other hand, were what I could take risks on. But then the used records started disappearing altogether. Trip after trip to the stores, I would come away empty-handed, because where there used to be predominantly used records and a spattering of new prints, now there were only ever $30 versions of albums released decades ago. I can no longer take risks on my vinyl purchases, the way I did as a freshman when I bought Led Zeppelin for $7.95 based on its iconic cover triggering my cultural knowledge that it was a piece of music I should listen to. I didn’t know if I’d even like the band, but at the very least I had the invitation to take a chance on it. In short, I got priced out of collecting records — at least locally. Granted, I could buy used albums from a much more competitive marketplace — such as Amazon — but that would discount the way in which navigating a record collection in-store is an exploratory experience, the way in which Berkeley’s record stores are community spaces that have brought live performances and signings with bands touring through town. It would mean giving up the conversations I’ve had with other music lovers and with enthusiastic staff who are happy to recommend me an obscure record based on my interests. I wondered whether I was behaving like a crotchety old man, seeing what I wanted (or didn’t want) to see. So I went through my record collection and tallied the cost of every used record I’ve bought. I then graphed what my secondhand collection looks like (with the 25 records I have of my collection here in Berkeley). I am, evidently, a cheapskate — the best-fit price for a secondhand record I buy is between $3-5. The question is this: Could I go to Amoeba and Mad Monk today and buy the same types of popular records — Pink Floyd, The Beatles, Queen, etc. — with the same distribution? I decided to try it out. I stopped by Amoeba and Mad Monk and tallied up the prices of records by popular bands for which I own albums. I plotted those with enough offerings to calculate a distribution. The first thing that should jump out is that, if I walked into Amoeba and wanted to buy any album by any of the bands listed here, my chances of finding one below 10 dollars is practically nil, and even 15 dollars would leave me with a very marginal sample of all the records available (and most likely the band’s least popular releases). The second thing that should jump out is the Beatles. In particular, what should be surprising to anyone used to shopping for Beatles albums is that there is a massive spike at around 20 dollars — that’s the price of a new print. Problem is, the Beatles are one of the most prolific bands of all time; in the past, two, even three rows of records at the store would be devoted to tons of used, cheap Beatles records. Yet, out of the 59 Beatles records I tallied at Amoeba, only three were secondhand — and even those were upwards of $15. In fact, out of the total 213 albums represented on the chart above, only 13 were used. That’s 6 percent. The vast majority of available records by these popular, old school bands were new pressings. There are a few bands not shown above (as the total number for sale was too small) for which some cheap albums existed; for example, the collection of Hall & Oates records was a nice mix of new and secondhand, with an average price of $7.46, and though the mean of the Van Halen availability was $18.12, two used records in the group were a reasonable $1.99 and $9.00, respectively. On the other hand, of the six records on sale by the Cars, three were more than $40 — including the album I bought for $4.00 used — and the others were all over $20. For The Clash, even the two used offerings were more than $25. The only used offering for the Doors (at $15) was for a “Greatest Hits” album. The only copy of Led Zeppelin in the rack when I checked was a reprint for $49.95. And what about my love, Queen? Amoeba had three full LPs on-rack: News of the World for $30, Flash Gordon for $30 and the live album On Air for $76. Mad Monk fared notably better. The reason the distribution in prices at Mad Monk extends lower (into the less than $10 range) is because, compared to Amoeba, Mad Monk has many more used records available to begin with — though the Rolling Stones are the only major band to really have a cheap collection available of those checked. Out of the 220 records represented in the Mad Monk plot, 73 were new and 147 were used — that’s about 66 percent used. But the average cost of those used records was still peaked at or above $15 per record. I won’t call this process “scientific” — as someone who visits record stores frequently, I’m well aware that incoming shipments of used vinyls are fairly stochastic, like in any used-product marketplace (and as a scientist, I hesitate to claim anything strongly when dealing with such small-number statistics). But these results line up with the trends I’ve been seeing in the last year or two. And vinyl’s newfound popularity has created that need. “It’s no surprise what sells big time,” Smith said. “It’s what has always sold: Led Zeppelin, the Stones, the Beatles.” All that’s changing is that a new market of buyers is willing to pay more for them. It’s buyers who, as Smith describes it, are “flipping through records while looking at their phones,” instantly accessing metadata from Discogs or Allmusic to know which pressing is the one they want. Ultimately, that’s nothing new. It’s just, as Smith puts it, “a fine-tuning of the same decisions people have been making for decades.” But in the process, more casual music fans are being left behind. Granted, for those listeners willing to step away from mainstream “classic” bands, secondhand prices get demonstrably better. Smith might be right that there’s never been a better time to be collecting. But, at least in the last decade, there’s also been no worse time to try to start. If I arrived at UC Berkeley in 2018 as a bright-eyed freshman, I might wander into Amoeba or Mad Monk after getting Cream with my CalSo group (or Golden Bear Orientation, or whatever they’re calling it now) and discover the magic of vinyl. But I would also see the prices of most of the offerings I would recognize as a freshman, and immediately decide it was a hobby for someone with a larger pocketbook. I wouldn’t start, much less complete, the collection I do now. It’s a shame that Berkeley, just a few years ago, was a place where you could. Imad Pasha is the Weekender editor. Contact him at [email protected]dailycal.org and follow him on Twitter at @prappleizer.